Excellent watch, finely crafted. Had been looking for a new moonphase watch that was fashionable and could hold up to daily activities. This is a solid watch, yet very feminine. It is now my favorite. The stunning Vassilis timepiece incorporates a host of fine detailing that combines classic styling with modern sensibilities. The Vassilis is available in either a diamond-accented style or unadorned. The entire case features highly polished 316L stainless steel (also available in rose gold and yellow gold plated varieties, and a two-tone yellow gold and steel version). The easy-grip crown is fluted with an engraved Alexander logo. The genuine mother-of-pearl dial is available in a range of colors from a restrained iridescent white, to a bold marbled blue and warm opalescent brown. The hour track is accented with 10 hand-applied faceted metallic markers sitting elegantly beneath the flat sapphire crystal glass. With a range of surfacing treatments, the dial exhibits a textured wave pattern guilloche for the lower half of the moon-phase in the center. Two hand-applied roman hour markers sit at the cardinal points 6 and 12. At 4:30 is a circular date aperture for the day-of-the-month. The Swiss Made hallmarking is printed at 6. The arrow hands accent either the moon-phase backdrop or the case metal color. The 50-meter water resistant timepiece features Ronda's 708 Swiss Quartz movement. The 316L stainless steel brushed and polished bracelet ends in a hallmarked twin push-button deployant (folding) buckle with the Alexander logo. The Vassilis suits both the casual watch wearer and those looking to dress up for an occasion. The 14 mm wide (at the clasp) bracelet will fit wrists from 6 to 8 inches (approx. 150mm to 200mm). Bought this for my birthday. 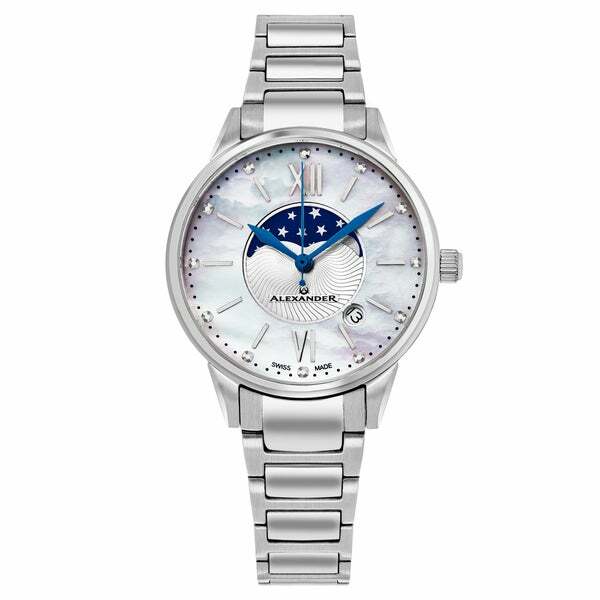 It is a solid stainless steel watch, but still very feminine. Very pleased with the look and quality.